The European Commission have revised tachograph legislation to make the manipulation of tachograph data harder, improve the efficiency of the control of the system and reduce admin. The result is Annex 1C (EU 2016/799), which was approved in June 2016, and leads to the introduction of the “smart” tachograph in June 2019. 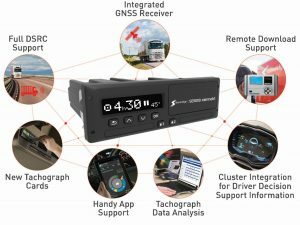 At Stoneridge we have created the SE5000 Connekt, our “Annex 1C” smart tachograph, to meet this new regulation. What is a smart tachograph? Smart tachographs will have a GNSS (Global Navigation Satellite System) module which automatically records your vehicle location at the start and the end of the journey, as well as updates it every three hours. Plus, the smart tachograph will be able to remotely communicate with road side inspection officers. Enforcement officers will use a short range radio device, remotely checking certain tachograph data without stopping the vehicle. So, they can remotely detect potential offences. If no issues are found, drivers stay on the road and continue their journey uninterrupted – meaning no valuable time is wasted on unnecessary roadside inspections. When will it be introduced? New smart tachographs will be mounted in new vehicles starting from 15th June 2019. At Stoneridge, we are working hard to deliver our own smart tachograph. To make the move to the new tachograph as smooth as possible, we are taking a step by step approach to production, starting in plenty of time before the introduction date. Stoneridge are ready to help you to make this transition.